Middle and Upper School Librarian, Webb School of Knoxville, Knoxville, Tenn.
Kate Lewallen is the middle and upper school librarian at the Webb School of Knoxville in Knoxville, Tenn., where she plans programs that support school curriculum and just get kids into the library. She received her MLIS from the University of Alabama and, before coming to Webb, worked as the access services librarian at Tennessee Wesleyan University. 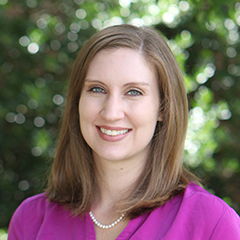 Kate has previously shared her programs through local conferences and webinars, and in 2016 she published a chapter on collaboration and programming at small colleges in the ACRL book, "The Small and Rural Academic Library: Leveraging Resources, Overcoming Limitations."